I spent Monday filtering through the posts-in-progress I had intended for My Frugal Miser. Turns out I never posted a year over year spending comparison. I consider this a critical tool in keeping my expenses in check. Better late than never, right? 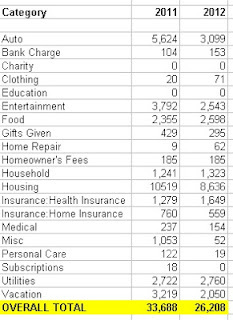 This is the second year (see last year's post) I've looked at how my spending by category compares from one year to another. How insightful to look back and see where the money went, but also to see how my spending patterns changed over time. Driving my 2007 Toyota Corolla (and mystery shopping for free gas and service whenever possible) reduced Auto Expenses by 45%. I reduced Entertainment Expenses by $1,249, or 1/3, by gambling less. I cut my Housing Expenses by moving to a smaller home in Florida. Housing still represented 33% of my annual expenses. Searching for a house took the place of traditional vacations, which helped reduce this category. We would have spent even less had I been able to refund the cruise we had to cancel. In Housing Expenses, we will see the full effect of our move to Florida. We will continue the theme of "spend on experiences, not things". When you wake up in paradise every morning, the need to "get away" is mitigated, but a vacation or two is overdue. Spending on utilities will be lower this year. We no longer have a gas bill and my partner is about to start paying the water bill. These numbers have been manipulated (I reported 2011 spending of $42,468 in my post last year). 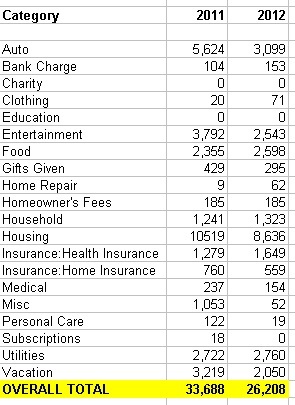 I removed the Mortgage Interest and Interest Expense categories since they included both personal and business expenses. I created a Housing category and manually added my mortgage from the house I call home. I decided to keep reporting Interest Expense even though virtually all of this expense is directly attributed to my real estate business. Yesterday I completed the last of the 10 dealer service shops on this route. I drove to Birmingham to meet with my handyman. The work he and his team have done is looking great. Hopefully the next time I am in the area (August 7th), Townhouse #2 will be ready to rent. I woke up this morning in my $279/night Buckhead hotel. It is the second and final night for this shop. I am waiting for my room service breakfast. Soon afterwards I hit pavement and head south. This weekend should be slow (I really need a couple of do-nothing days!). I am doing a drive-thru lunch shop tomorrow at a local Chinese restaurant but have nothing else lined up. We leave for Vegas on Monday, late afternoon. It's the first real vacation we have taken in nearly two years. We have five nights booked at the Suncoast. The room and food are comped as well as $100/day in gaming. No, I am not a heavy gambler. Can't for the life of me figure out why the casino is so generous. A couple of days after we return for Vegas, the mega road trip begins. It is so overwhelming that I don't even want to think about it right now. I just have to keep reminding myself how much the extra income will help. I guess my tenants waited until I moved 500+ miles away to start acting up. That or it is just coincidence that I have had so much activity going on at the rental houses. I am in Atlanta today, wrapping up a dealer service/hotel/gas station mystery shopping route. But later this morning I have to make a trip into Birmingham. I wanted to go anyway to see the repairs my handyman has made to Townhouse #2. Now I have to bring a 7 Day Notice to post on Townhouse #3. I have been too lenient, that's for sure. This tenant still owes part of his May rent. His May rent check, which wasn't even paid until the first of July, bounced. He gave me $300 towards that but that is the last I heard. Now he isn't even answering the phone when I call. I know being a landlord has its ups and downs, but I never imagined all this would happen at once. 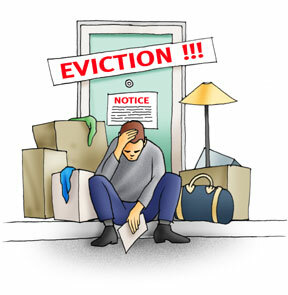 In the 11 months that I have been in Florida, I have had three evictions, two tenant deaths, and one clean move out/move in. That's 6 "situations" out of my 10 Birmingham-area properties. I have another tenant (let's call her Townhouse #4) who is making regular rent deposits but falls a little more behind every month. Right now the decision is easy - I can't take on another eviction right now, especially when there is at least some effort involved in the tenant trying to stay. I pulled the trigger. Last night I accepted the largest, longest, most lucrative mystery shopping route I have ever undertaken (and for that matter, it could be the longest route ANYONE has attempted). Between August 6th and October 31st, I will embark on a massive route that takes me as far west as the Utah/Nevada line and as far east as the Carolina coast. I will be shopping the service departments at a vehicle dealership. The compensation I negotiated is based on 50 hotel stays and more than 12,000 miles of driving. I have already begun the planning process. To keep from overwhelming myself I am scheduling two weeks at a time. The company I am working with is giving me the flexibility of doing these shops in whatever order I want. The only requirement is that they all be done by the end of October. That means that I can take breaks whenever I feel the urge. I plan to take photos and keep a travel blog right here at this site. Stay tuned. I wrapped up my South Florida dealership shops yesterday and was home mid-afternoon. We used a Groupon for an Indian restaurant and then went to see Red 2. I don't like going to the movies at night because it costs more and is more crowded, but we had a free pass and only had to pay for one of the tickets. Plus I've been traveling so much that my partner and I haven't had much time together. Tomorrow I am leaving at 4 AM and headed to rural southern Georgia. I am working my way up to the suburbs of Atlanta. In all I have 10 dealer service shops, a 2 night hotel shop and 2 gas station shops. I will have some down time for more shops if I find anything interesting. If time permits I will make a quick trip to Birmingham while in Atlanta. I hired another handyman to work on Townhouse #2 and want to look at his work plus do a few small repairs myself. This guy has 30+ years experience and so far I have been impressed by his work - and super relieved to have found a reliable, quality worker. Of course, his work isn't cheap, but at this point I am most interested in getting the place rented. 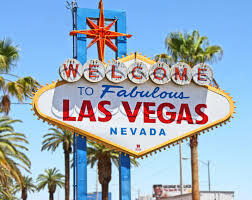 Monday, 7/29 we leave for Las Vegas. It's the first real vacation we have had in nearly two years. Our last vacation was canceled when my friend passed away. For this trip the room is comped, plus I have a $100 daily food credit and $100 daily gambling credit. I have no idea why Boyd is being so generous, but I'm not complaining. I am negotiating for a HUGE mystery shopping route. It is for the dealer service shops. This is the mother of all routes. For perspective, the mystery shopping company estimates I will need to be reimbursed for 50 hotel nights to complete it. If everything works out I would begin my route after our vacation. Mystery shopping across America sometimes takes me to places I actually want to go. 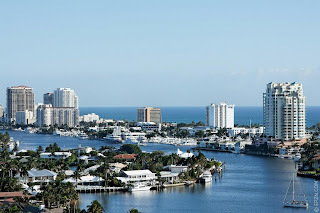 This week I head to Palm Beach and Boca Raton for dealer service shops. No one on earth rotates his vehicle's tires more than I do! With the glamour comes a dose of reality: most lucrative shopping takes place in less desirable areas. Sunday night I drive to rural southern Georgia. I am spending next week rotating my tires throughout the State of Georgia. I will visit 10 dealerships. For aspiring mystery shoppers, let me say: there are opportunities that pay real money for your work. One of the most common complaints I hear from my fellow shoppers is that the industry doesn't pay enough to make it worthwhile. With these dealership shops, my mileage and hotel stays are being reimbursed in addition to bonuses on the regular shop fees. I don't have to kill myself, either: each day I do 2-3 dealership shops, no more. I am free to find other work or none at all as long as those jobs get done. The other perks I enjoy are pretty standard. I keep the loyalty points for my hotel stays. I also keep the rewards on my credit cards, including the 5% cash back rebate for gas via a couple of my credit cards this quarter. I have been on the road for almost a week and am itching to return home. I left Clearwater at 4 AM Monday and spent that day doing shops in Florida, Alabama and Mississippi. I made it to my destination after a grueling 21 hour day, only to embark on a 19 hour day Tuesday that included many mystery shops but also some work on my rental properties. Wednesday, Thursday and yesterday were equally busy. While I originally was coming here to work on my rental properties, the appeal of a route pulled me away from that. One company offered me $.50 per mile from Clearwater to Birmingham and back if I would pick up 7 shops that needed completing. That was in addition to the shop fees, most of which had bonuses. Those 7 shops paid just over $1,000 with mileage. I also completed 50 gas station shops, which gave me $300 in fees, $250 in gas and $50 in snacks. I wrapped up the mystery shopping with a hotel shop last night. My original plan was to head home early this morning, but nothing seems to work like it should. I had to release my handyman from his duties last night. Fortunately I have another worker who has been helping me this week, but with so much work left on Townhouse #2, I am playing it by ear as far as when I will return home. It could be later tonight or it could be tomorrow. This experience just adds to my feelings that being an absentee landlord is a bad idea. It requires me to have trusted resources in Birmingham or for me to travel every time something needs to be done. I thought I had a trusted resource but I was burned. It also makes collections a harder task. I still have one tenant whom I will probably have to evict. I don't know why I did not just start the process but it had something to do with him looking me in the eye, in the presence of his four year old daughter, and promising that he will have some rent for me next week. Seems like I've rode that horse before. Okay, so yesterday I confessed that I probably won't be expanding my real estate empire. The next question is, what will I do to support myself? First, I will continue to pay off debt. Excess cash will go towards the mortgages on my rental properties. Then, I will deploy excess cash into maintenance-free investing: think stocks or even index funds. This is not something that will happen in the short term. It's a major shift, and I am not in a hurry to shed profitable assets. Divestiture will happen when opportunity presents itself. When I meet an overly optimistic market, I will offer my assets to that market. My goal is to smoothly transition to a maintenance-free portfolio that produces enough income to fund "life". I would like to think that I can accomplish this in 10 years, but I am not foolish enough to think I can define a parameter just yet. My next goal is to invest $400,000 in relatively secure equities that consistently yield 7-10% per year. If we are debt-free, having $28,000-$40,000 per year is more than we need. It would mean that we can live off what we need and reinvest the excess. Don't get me wrong - I can't "stop" accumulating wealth and coast the rest of the way. $400K still makes me nervous. But it is enough to give me the cushion I need to stop worrying about our day-to-day needs. I almost never write things by hand. Several months ago, I wrote this post in a notebook. I set it aside but looked at it several times. The reason I did this was because what I am about to say will be a dramatic shift in how I live my life. I don't take this lightly, so I wanted to dwell on it long enough to know this was the right thing to do. I'm shifting gears. I don't want to be a landlord forever. For those of you who have been doing the same thing for many years, have you ever had a bad day at your job and dream about a new career? Some time ago I started thinking about whether I wanted to commit to being a landlord for the rest of my days. I have done exceptionally well with real estate. Tell me what else you can invest in with a 33% annual return net of expenses? Who would give up such a thing. Here's the deal: I value my freedom more than anything. Having tenants is having golden handcuffs. They pay my bills, but I have to jump when they say jump. I have invested thousands of dollars and hours of effort into making a house nice - better than my own - only to have my tenant trash the place and leave owing back rent. I had a tenant forge a check to pay her rent, two tenants have died (one of them inside my house), others give me the runaround about why they can't pay rent - all while subscribing to a platinum satellite TV package, smoking premium cigarettes, and buying a second car (let me clarify - a brand new second car, for a single tenant who already had a perfectly drivable vehicle). What I have decided is to curtail future real estate purchases. I plan to buy a permanent residence for my family and will only buy additional rental properties when the deal is hands-down, an absolute no-brainer. Truthfully I hope I don't find any deals. Tomorrow I will let you know how I plan to earn my income moving forward. It was time to replace my spark plugs and spark plug wires. I prefer to do things myself when I can, but after watching half a dozen Youtube videos and visually inspecting my Chevy S-10, I did not want to take on this project. With many vehicles all you have to do is pop open the hood, untwist the old wires, unscrew the plugs, and screw in the new ones. But the S-10's spark plugs were located behind the wheel well, beneath a rubbery flap and around a number of other wires and tubes. One look at it and I just knew I was going to screw something up if I did this myself. When I had the catalytic converter replaced on my truck last month, the big chain shop that did the job offered to replace my plugs and wires for $300. Their labor charge was $162; parts were $138. Starting with this as my baseline, I looked online for my parts. Since I had a 50% off coupon for Advance Auto Parts, along with 5.5% cash back by clicking the link at Ebates.com, I did not have to shop around for my parts. Instead of the $138 that Tires Plus wanted, I managed to secure what I needed for just $39 with tax. I bought the highest rated exact-fit parts (including AC Delco spark plugs). This alone saved me $99. Then I called around for labor estimates. I don't know why it has taken me so long to realize that small independent repair shops are 1) almost always less expensive and 2) more trustworthy. In addition to the $162 quote from Tires Plus, I received three other quotes: $110.00, $162.41, and $178.00. The $110.00 quote happened to be from the shop closest to my house (less than a mile) and was the only independent shop I called. The owner/mechanic answered the phone when I called and said he could take care of it the next day. Low overhead should mean lower prices and in this case that was quite the case. As an aside, I checked out online reviews for the independent guy before I brought the S-10 in. Every one of the reviews cited the mechanic's honesty and his low prices. One example was from a guy who had received a quote of $1,500 for a repair at a national chain. The same repair was just $700 at the independent shop. If you are like me, you hate it when something breaks. Often I can figure out how to fix something myself, but when I can't, it is nice to know I don't have to be ripped off. Granddad worked in the same occupation, at the same company, for almost his entire life. In the 1950s he was offered the position of plant supervisor for a new location his company was opening. My grandparents and my mother (who was a toddler at the time) packed up their bags and moved from Omaha to a small town in Alabama. They built a home which my grandfather lived in until we moved him to a nursing home. He retired from the feed mill in the 1990s. When my brother and I visited as children, there were days when we saw very little of Grandad. He woke up at 3 AM every morning and left for work. He usually got off work mid-afternoon and headed to another job. The side jobs included maintenance at a marina and shopping center in town, cutting grass for several people, painting, and eventually ownership of a bowling alley. Bowling was his only hobby, and he and three friends invested in building a 20 lane facility that included a driving range, go carts, miniature golf and batting cages. He never made much money with that business but he loved it. My grandparents were generally thrifty, but they spent money on experiences. They were thrifty in their day to day habits. My grandmother sewed, so she altered their clothes as needed, made some of her own outfits, and created amazing Afghan blankets. My grandfather did all the repairs around the home. He built a tile shower in the basement so he could bathe downstairs when he came home from work instead of dirtying up the home. He liked cooking out and relaxing outdoors so he built a screened in porch, which he enlarged more than once over the years (it's pretty big!). They rarely ate out. When my brother and I visited we might walk to the Dairy Hut for a snack; occasionally we would go somewhere for breakfast or lunch. We always ate dinner at the house. They did spend money on certain things. My grandmother only drove new Buicks with leather seats. They took a lot of vacations, including trips to Vegas, Reno or wherever a bowling tournament was being held. As far as investing is concerned, they were conservative - more so than I will ever be. The vast majority of assets were held in bank CDs. Even so, there was a respectable (but modest in my opinion) estate left after he passed away. And Debt? I think the only debt my grandparents ever had was the mortgage on their house. My grandfather was always working. That's what I remember most. But I do remember he did things to show his love. When I was 18 I bought my first house. My granddad came down for several days over the course of a month to completely remodel my bathroom. I learned the value of working for what you have from my grandfather, but that it was okay to spend some of your earnings every now and then. It's okay to spend money on nice things that you will appreciate and enjoy so long as you pay in cash and be frugal where it counts. June was a tough month. I did a lot of mystery shopping, so much that my out of pocket expenses exceeded my income. That means that July will be a good month for mystery shopping income since I will be paid for much of that work. My rental income took a hit which will be even more pronounced in July. Right now is a tough time for my rental property business. Five of my properties are not earning their full potential for various reasons. Townhouse #1 is basically ready to rent, but now I realize I will probably have to replace the air conditioner before a new tenant can move in. Townhouse #2 (the one where my tenant passed away) should be ready to rent by the end of July. All five of my townhouses are under-performing. I am taking steps to get everything back on track. As we celebrate this Independence Day, I thought it was a perfect time to tell you how I will reach financial independence. Even though I have income from mystery shopping, my rental properties are usually my cash cows. When 100% of my properties are rented and current, the income is about $8,000 per month. Of course, that does not mean I have $8,000 to spend each month. I have mortgages on several of those properties and, especially the last few months, I have had significant expenses for repairs, maintenance and vacancies. Cash Cows include my lower-tier rentals, of which I have 6. The last one, which I purchased at $20,500, rents for $700 per month. Even after expenses, I net several hundred dollars on that property. These tenants don't last long and don't take care of their homes. Prime Properties are my higher end, middle class single family residences. I have four of these, but I am leaning towards eliminating them. These are newer homes that require less maintenance and are occupied by higher quality tenants who tend to pay their rent on time and stay put. Three of the four have been occupied by just one tenant; the other has been occupied by the same tenant for 2.5+ years. 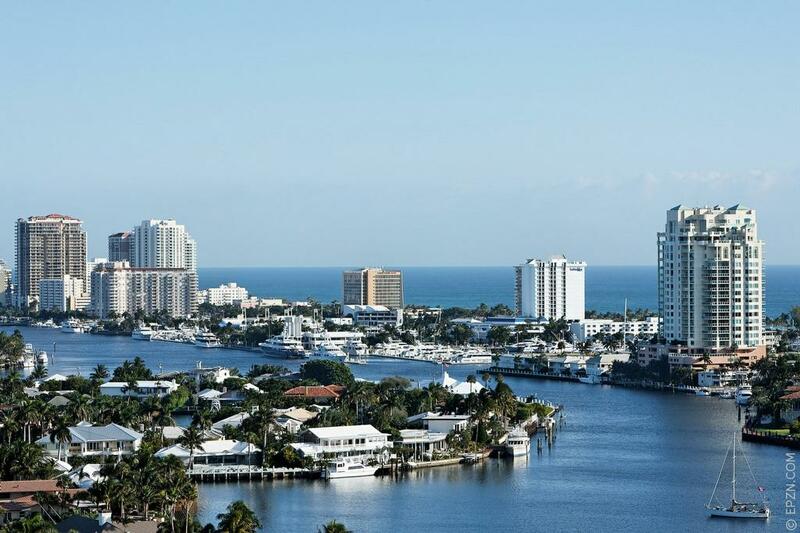 Developing is my Florida portfolio, of which there is just one property right now. What I have learned is that I make more money on the Cash Cows, but they require more effort. Makes sense, right? To address the effort involved while I am an absentee landlord, I am experimenting with a property management company to handle the day-to-day affairs of these properties. I have turned one home over to the company and am about to turn over a second one. The Prime Properties will become Cash Cows once I pay off the associated mortgages, but they do not earn at the same rate of return as the lower end houses. While on the lower end a $20K investment returns about $7K per year after expenses, a $155K investment, which rents for $1,250/mo., is barely breaking even after interest, taxes, insurance and HOA dues. I would probably be better off using those funds to buy several lower end houses. Lessons I have learned along the way are many. First of all, if I could change anything, I would not have taken on so much debt. When I lost my job in 2009, I had over $500,000 in debt and nearly all of that was on my rental properties. It might seem like having a $700 mortgage payment on a house that rents for $1,200 is a wise investment, but you will quickly learn otherwise when the rent stops coming in for whatever reason. Second, what often separates tenants from landlords are their lifestyles. My tenants live better than me, at least in conventional thinking. All of them have cable or satellite TV, and most of them have car payments. They have nice clothes, newer electronics, and often partake in expensive habits like smoking or drinking. I choose to live a frugal lifestyle so that I can pay off my debts as fast as possible. To me, financial freedom will be the day when I have zero debt and 100% of my properties are productive. The month of June was the second month this year where I spent more than I brought in. Most of my spending was to maintain and repair my rental properties. Unexpectedly, one of my tenants passed away in June. I wasted no time beginning the rehab on her townhouse, so there was no break between all the spending I did on the first townhouse and significant spending on this second one. Fortunately much of the spending is for improvements that will help me reduce future spending: I installed a new roof on one property ($2,625) and laminate floors to replace carpet on this second townhouse (more than $2,000 once I pay the installer). I try to keep my personal expenses under $1,500 per month. A major repair expense and the purchase of my Piaggio Fly 50 scooter kept me from meeting this goal in June. Note: Accountants would amortize the cost of my scooter, but I keep things simple when I can. The entire purchase price is counted as a June expense. Home repairs were higher than normal. A storm damaged the wooden fence in our back yard. I repaired it myself, so the cost is for material only. My rental properties cost me more than they brought in. I don't think that will happen again this year.